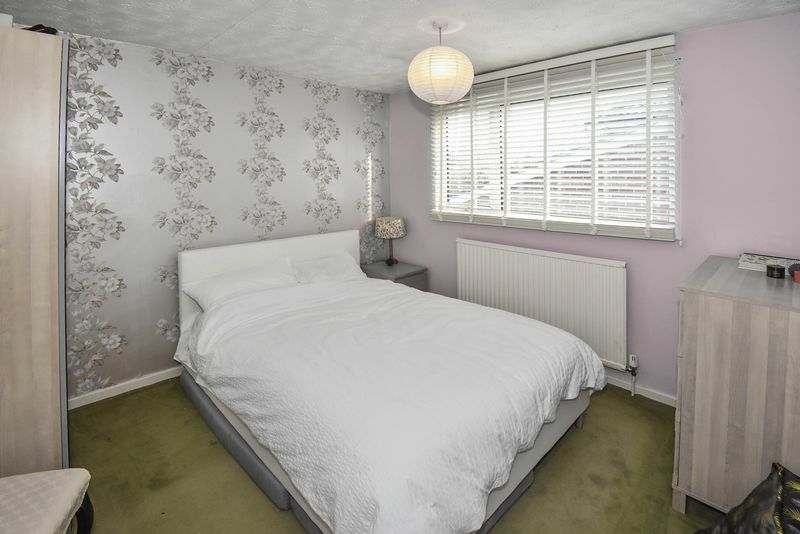 Briefly the property comprises: canopy porch; reception hall; ground floor WC; lounge; living/ dining/ kitchen; store room; utility room; study; landing; four double bedrooms; bathroom; garage store; large plot; driveway; PVC double glazing; gas central heating. Now this is a home which is sure to tick many of your boxes. 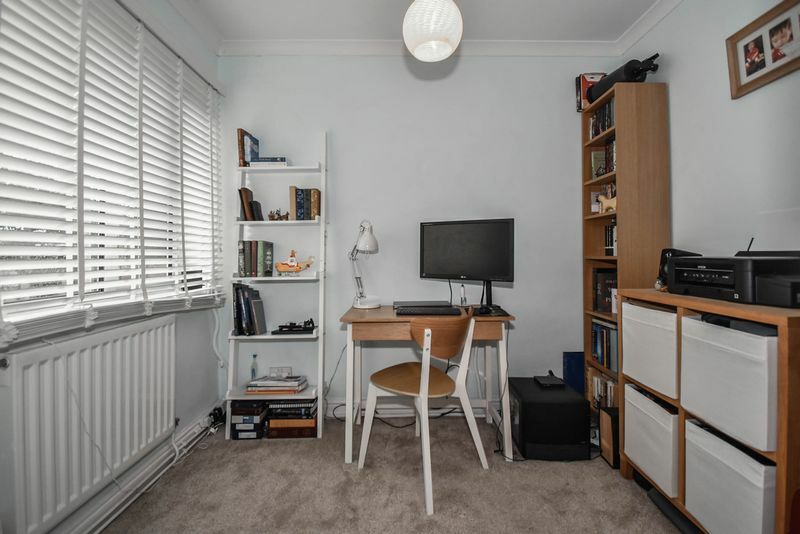 We are frequently asked for homes of this size, in this location, by frustrated house hunters who may have a choice of just a handful of similar properties per year. 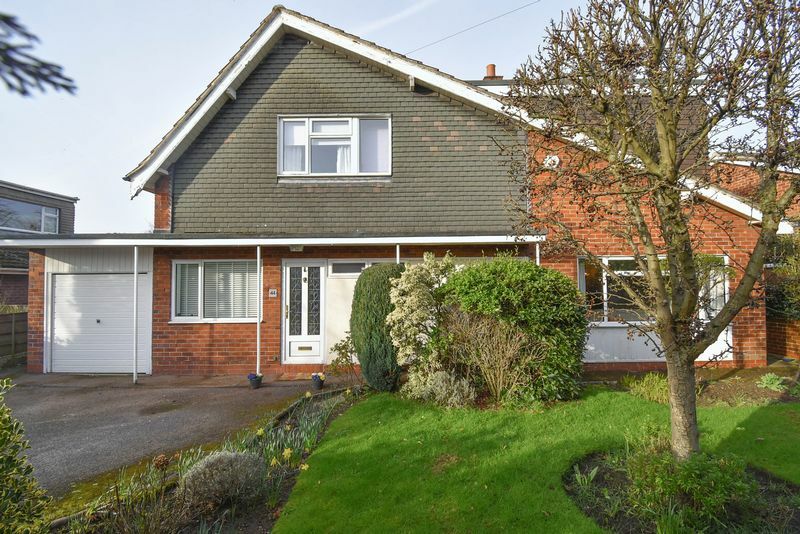 The location is so sought after as the community is pleasant, there are several desirable Primary and Secondary schools in the vicinity, plus the area is serviced by the excellent West Heath Shopping Centre. In addition, the Town Centre is close by and access to all major routes including the A34 and M6 is easy from here. 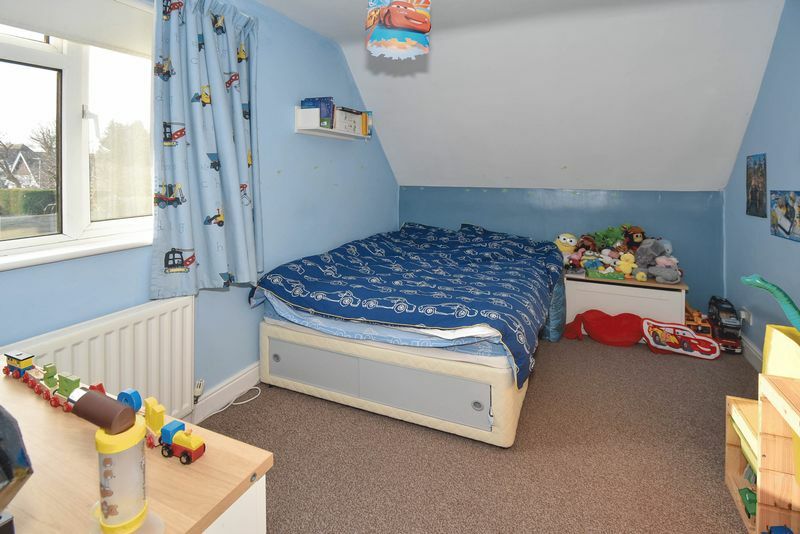 The home is big having been extended and improved over the years. It had a head start in life, being the larger of two similar styles of this home being built in the area. 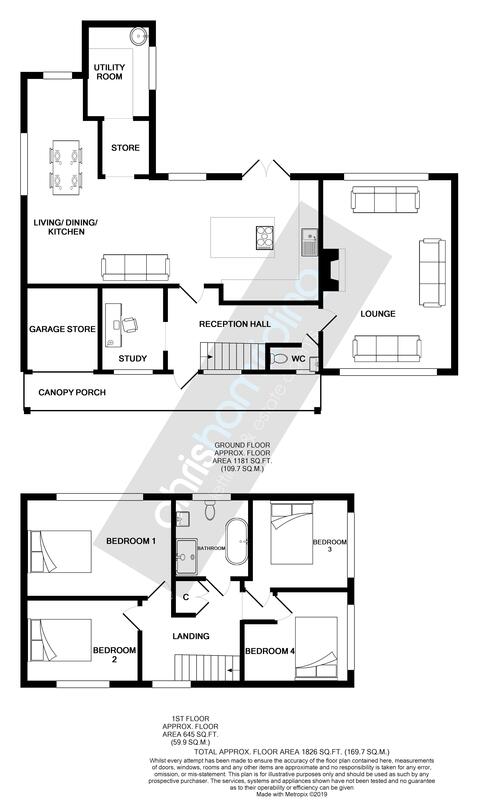 This is fortunate as the home has an inherently large footprint and features a large lounge with spacious hall and landing, study all belonging to the undeveloped format. 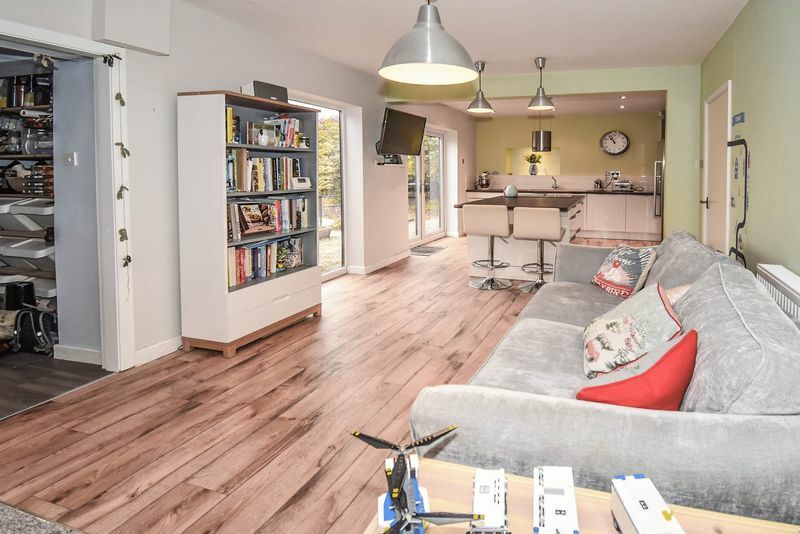 Post development, the home has grown to provide a large rear L shaped living/dining/ kitchen, store room, utility room and four double bedrooms, and now offers around 1650 sq ft of comfortable family friendly accommodation. 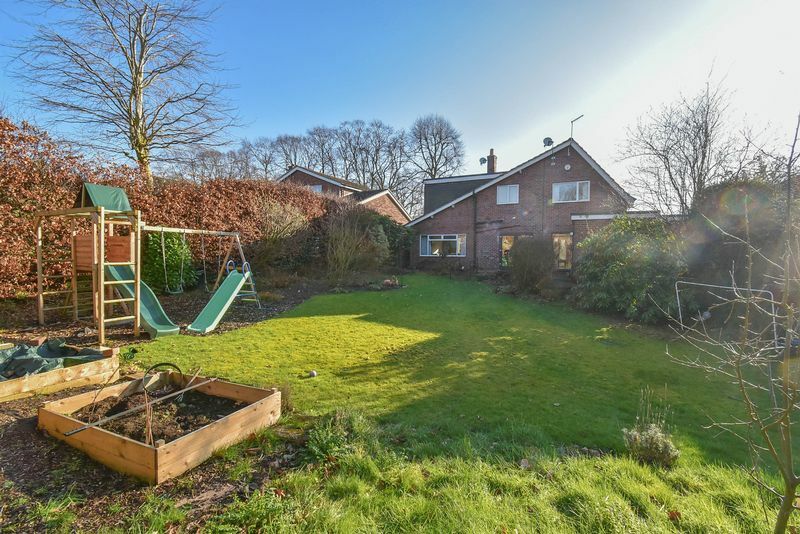 And, as an added bonus, being built in an era of relaxed generosity, the home enjoys a deep plot with a large rear garden. Its the type of plot where you can extend the home without overdeveloping the site. 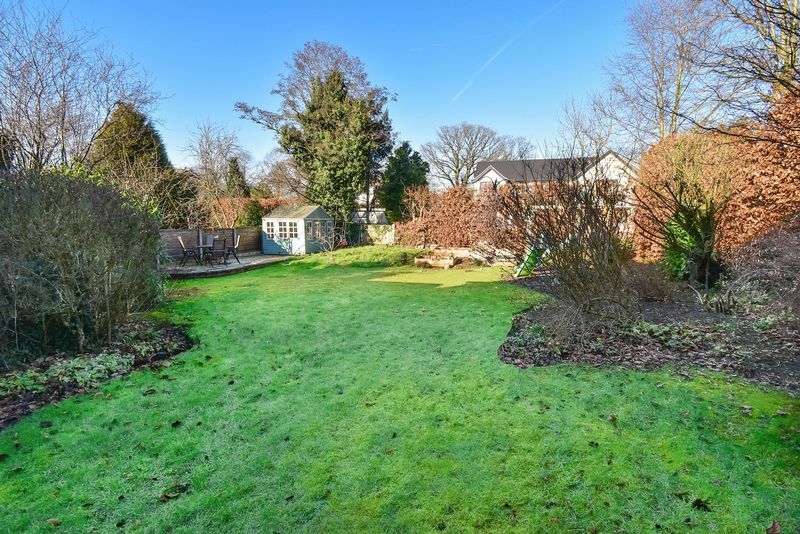 The gardens enjoy much maturity and degrees of privacy and offer huge potential for exciting landscaping should you so desire. The home has many appealing attributes you will love. In addition to the aforementioned luxury of space, its hugely functional too and caters wonderfully for family living. 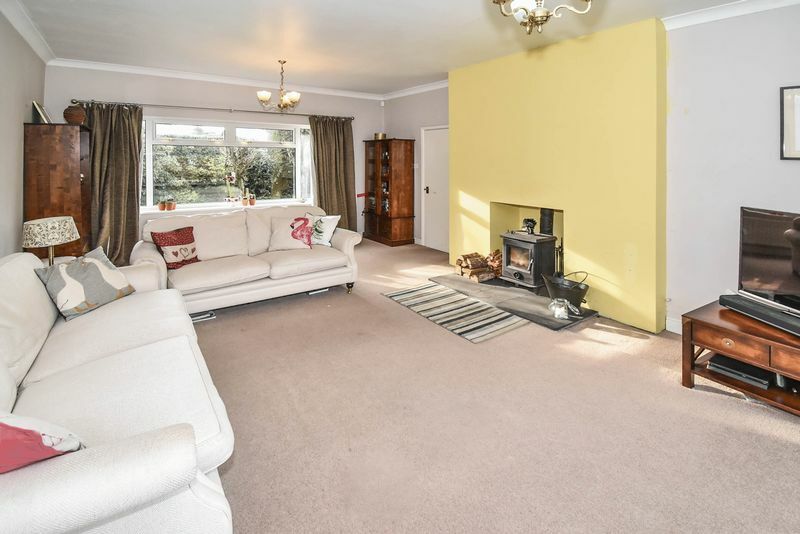 The large lounge with its fun log burner, four double bedrooms and study are all great spaces for work, rest and play. 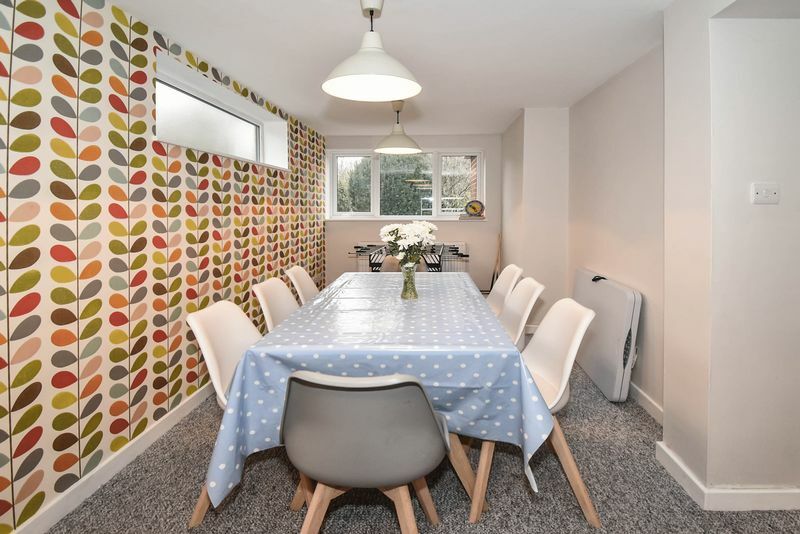 The 30 ft living/ dining/ kitchen is notably a wonderful room, especially for those with younger children where you can get on with your own tasks and the kids can be with you playing, eating, doing homework or watching tv. 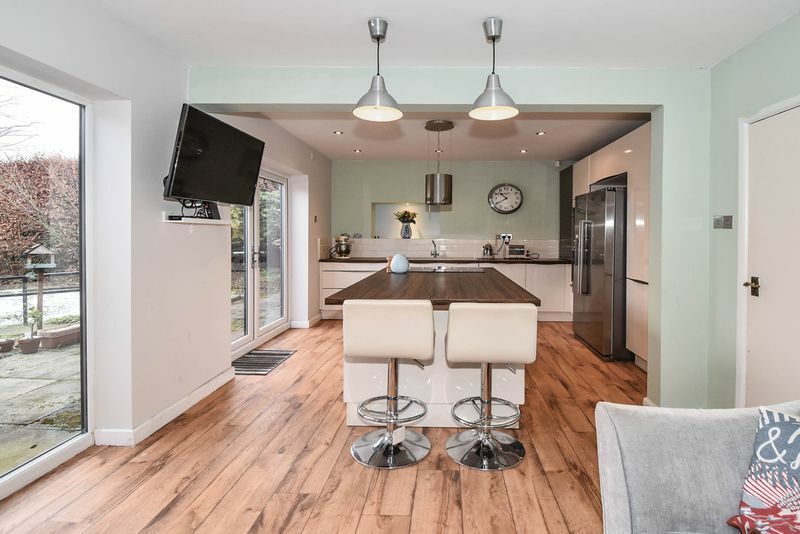 The current layout incorporates a stunning kitchen with island bar, open plan to a living area and play area, with the dining area located in the protruding L extension area. The room incorporates feature glazing and external French doors link the room beautifully to the rear family friendly garden. There is potential to replicate this feature on the lounge also, with a French door or a bi-fold door. 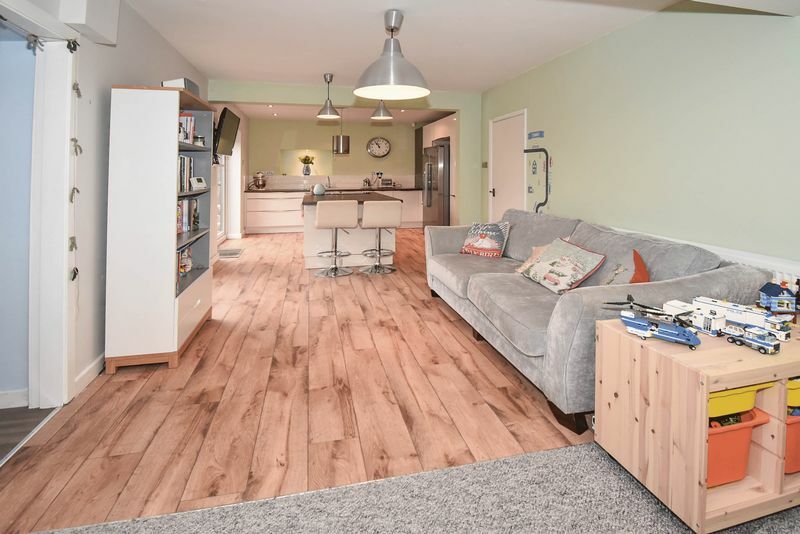 From the living kitchen area, you will find a valuable store room and a large utility room, with a huge amount of storage and locating the washer and dryer in an area which is not integrated in to the main body of the home. You will love the top quality kitchen and bathroom suites. 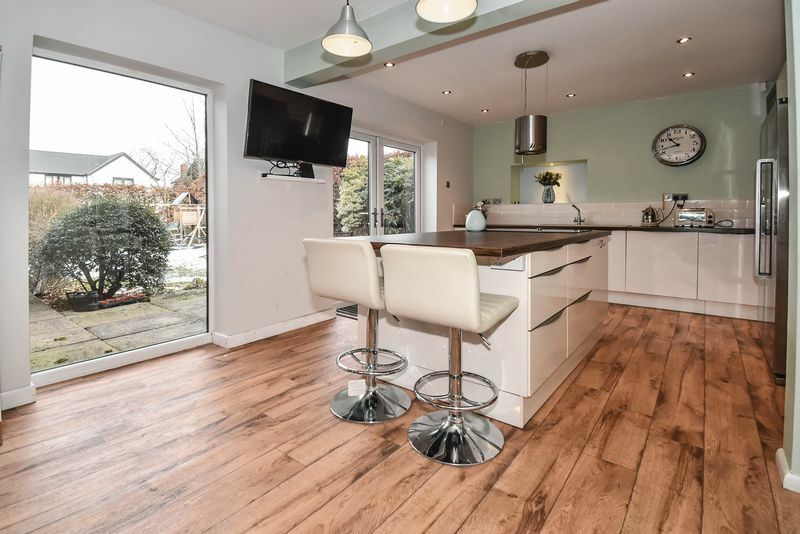 The kitchen comprises white gloss with contemporary wood style preparation surfaces. It is clearly a design of much consideration with many convenient storage solutions, a power supply to the island and to a wall storage unit intended as a coffee bar. Top of the range Neff appliances are installed featuring: oven with slide and hide door; combi microwave oven; wide flexi induction hob; dishwasher and Elica island fan. A Franke sink and tap is installed and a large Samsung American fridge freezer with independent water supply, icemaker and chilled water dispenser is included in the sale. 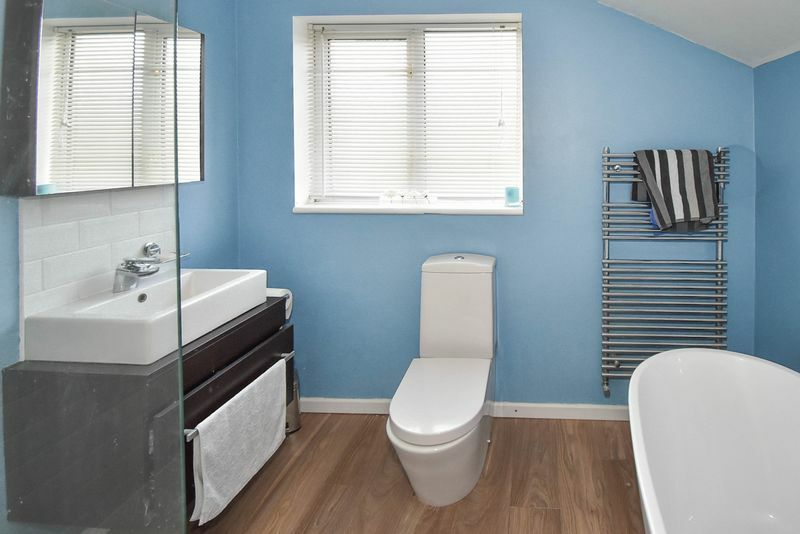 The bathroom is as equally impressive, with its contemporary tiling and matching storage cabinets, freestanding bath, large walk in shower and stylish chrome taps and showers. The appealing ground floor WC has also been modernised. Long canopy providing useful weather cover over the entrance and garage. PVC double glazed external door with ornamental floral glazing opening to the reception hall. Frosted window to the front aspect. Stairs to the first floor. Recessed ceiling down lighting. Oak wood style flooring. Central heating radiator. 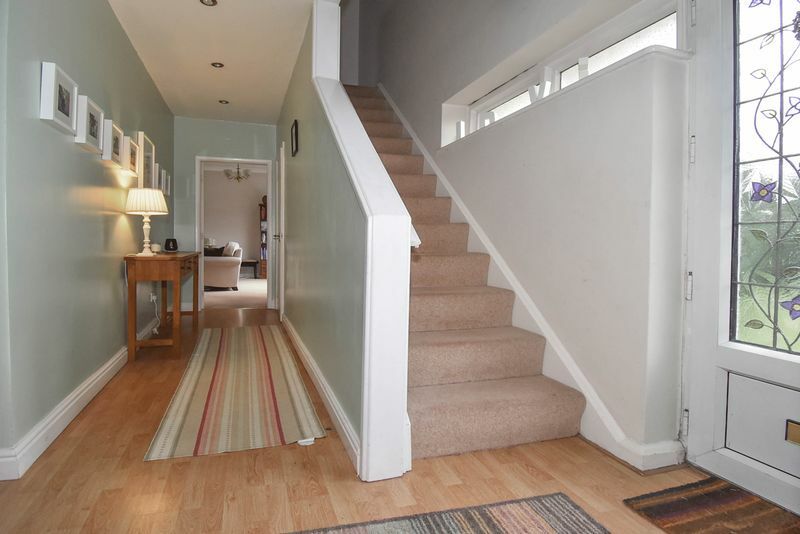 Access to the WC, lounge, living kitchen and study. 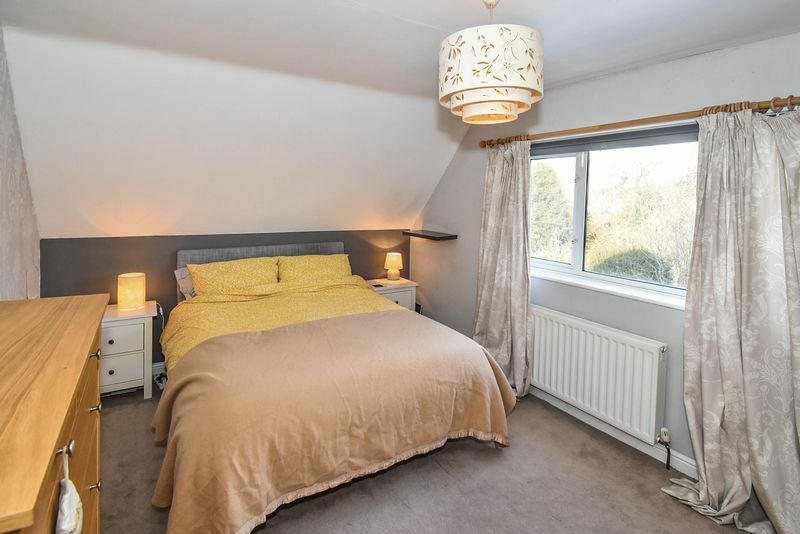 Spacious room with lofty ceiling height, bright dual aspect room with opposing front and rear PVC double glazed windows. Feature log burning stove set in to chimney breast recess and with stone hearth. Two ceiling pendant light points. Central heating radiator. 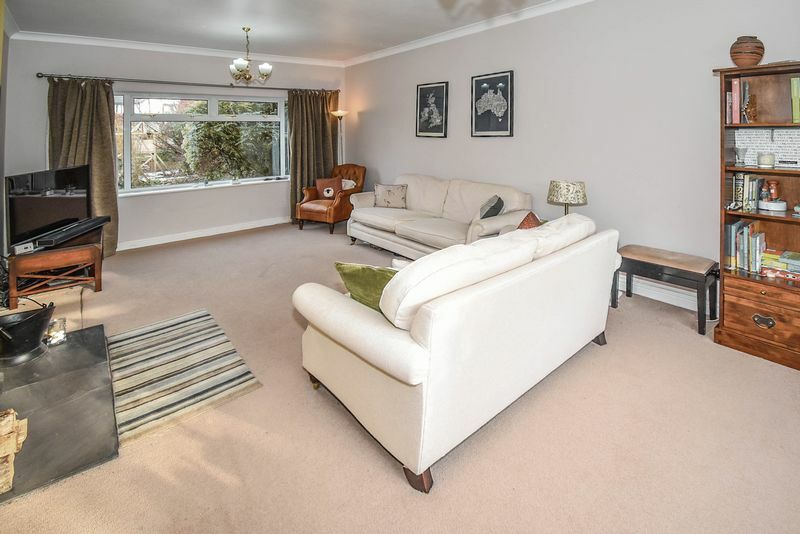 An exciting open plan L shaped room, with feature glazing, external French doors, a stunning luxury kitchen with super island bar, plus the expansive and versatile living/ dining areas which you can arrange to suit your own lifestyle. 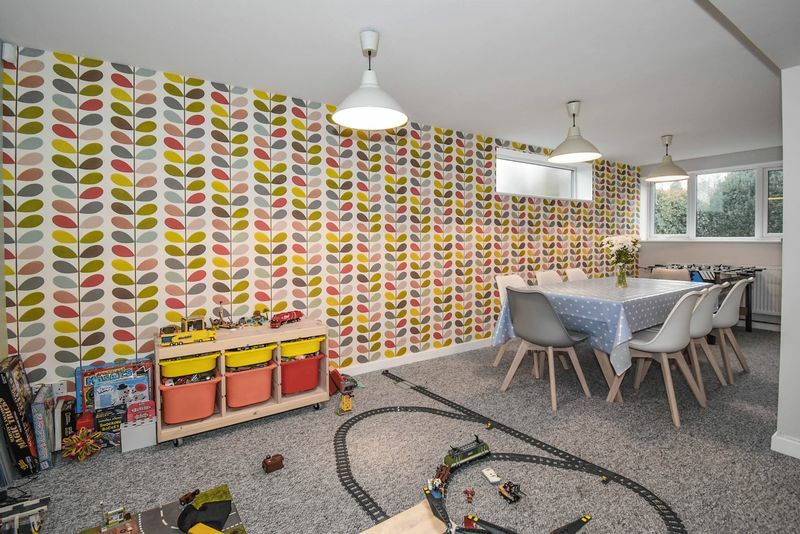 This is the 'everything' room, an ideal family space you can live out of. 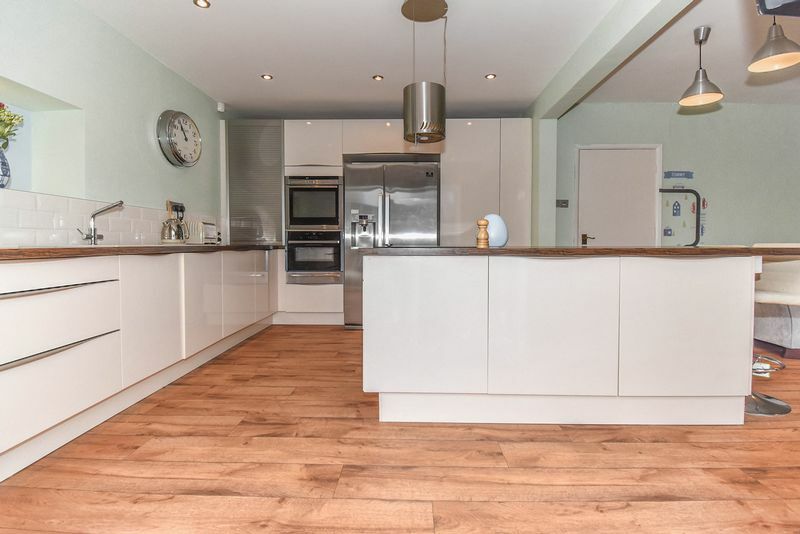 Impressive 31' living kitchen area, open plan to the dining area and enabling access to the store room and utility room. 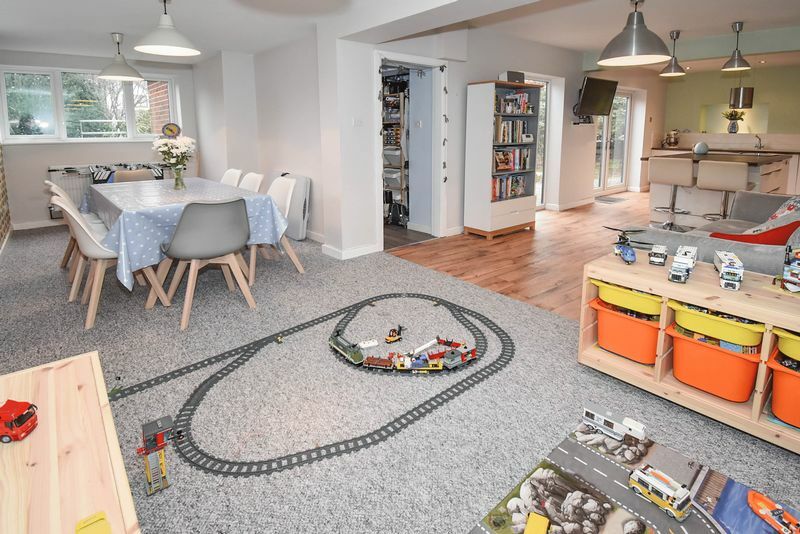 The length of the room enables individual spaces for the kitchen, living area plus the owner has comfortably created a child's play area, then there is the dining area! 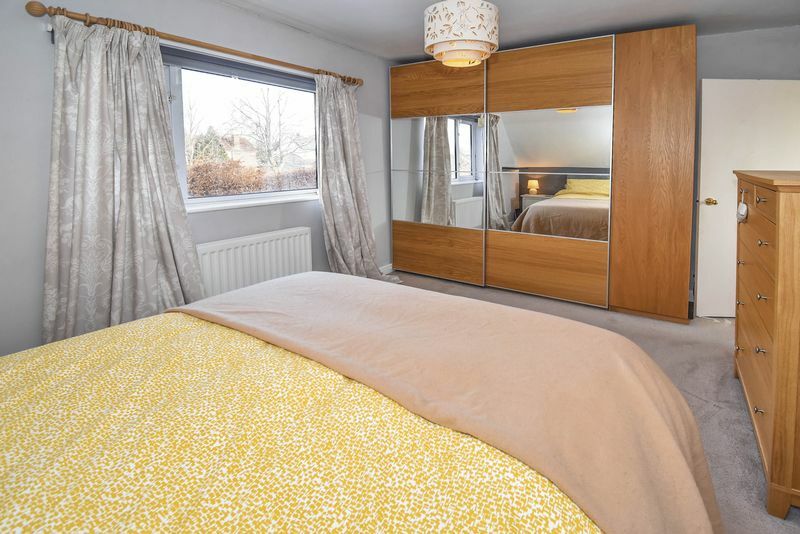 The room features a tall PVC double glazed picture window framing views of the garden. PVC double glazed French external doors lead out on to the rear outdoor patio terrace. Your dream kitchen awaits! 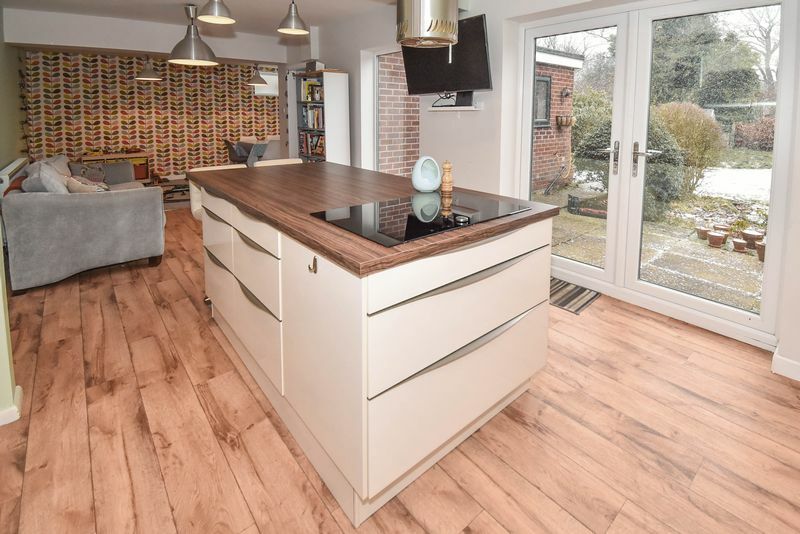 A very stylish quality designer white gloss German kitchen suite, with contemporary wood style preparation surfaces and stylish bevel edge brick tile splash backs. There is plenty of pleasing detail in the kitchen. 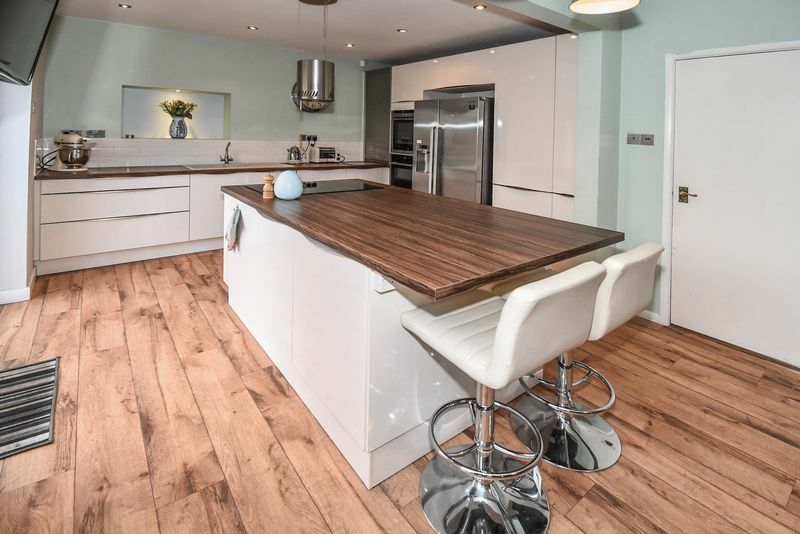 You will love the large island with its cooking station hob and suspended island fan. The island top extends to provide bar seating area and electric sockets are provided. The island features much practical storage too. Further exploration of the units uncovers many pan drawer storage units and a large mechanical sliding wire basket larder unit. A metallic tall roller door reveals a shelved unit, with power socket, intended as a coffee bar area. Packed with quality brand names you can trust, the kitchen features: a Franke sink and tap; feature Neff oven/ microwave combination unit; Neff oven with 'slide and hide' oven doo; Neff dishwasher; Neff wide flex induction island hob and Elica island fan; freestanding Samsung American fridge freezer with its own water supply which runs an ice maker/ dispenser and provides chilled water. 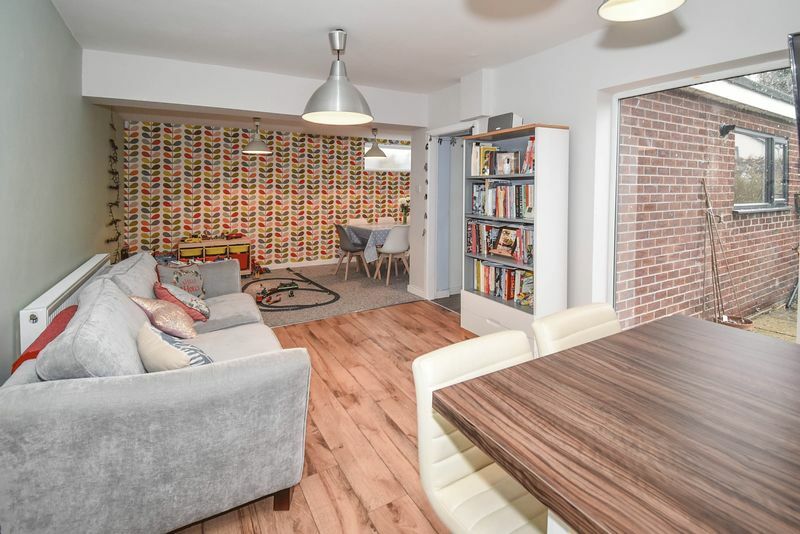 Other desirable features of the room include contemporary plank style flooring, a feature wall display recess with down light and wall concealed television wiring. Central heating radiator. PVC double glazed window to the rear and side aspect. Central heating radiator. 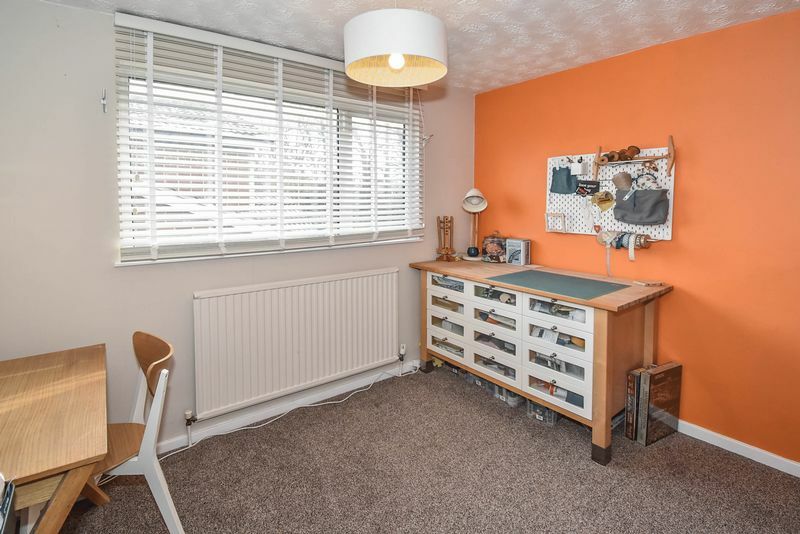 An ideal addition to any family home, the store room features a recessed storage area which the current owner has currently organised with a freestanding storage solution. Contemporary grey plank style floor. Access to the utility room. A large utility room, perfectly positioned close to the kitchen, enabling room for an additional freezer if required. There is lots of base storage and modern utility work surfaces with an integrated sink bowl. 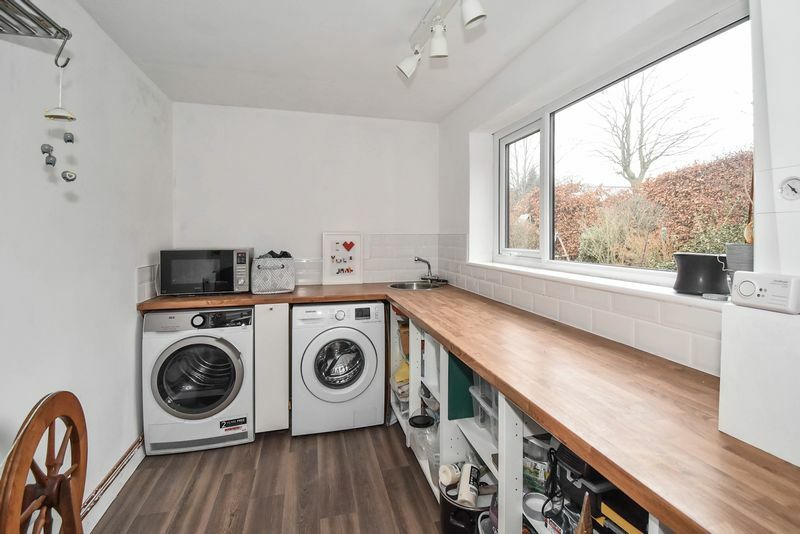 Space for a washing machine and tumble dryer. PVC double glazed window to the side. Central heating radiator. 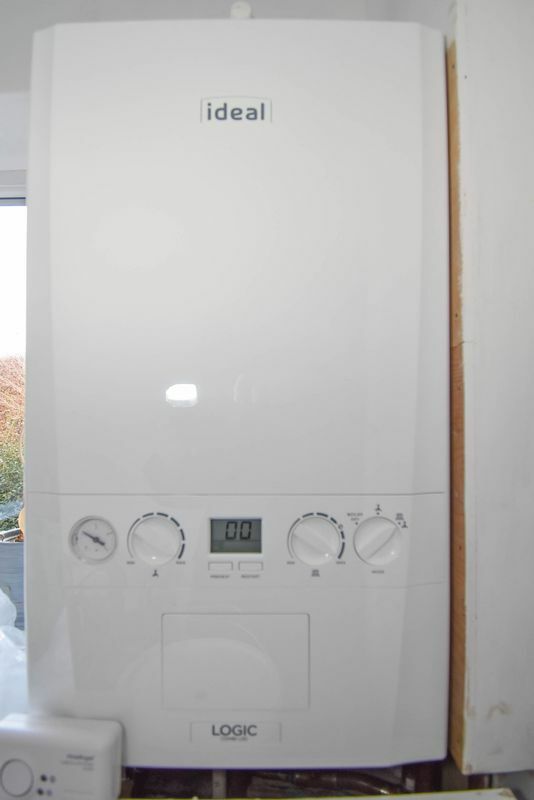 The Logic combi C30 gas central heating boiler was installed in 2018. 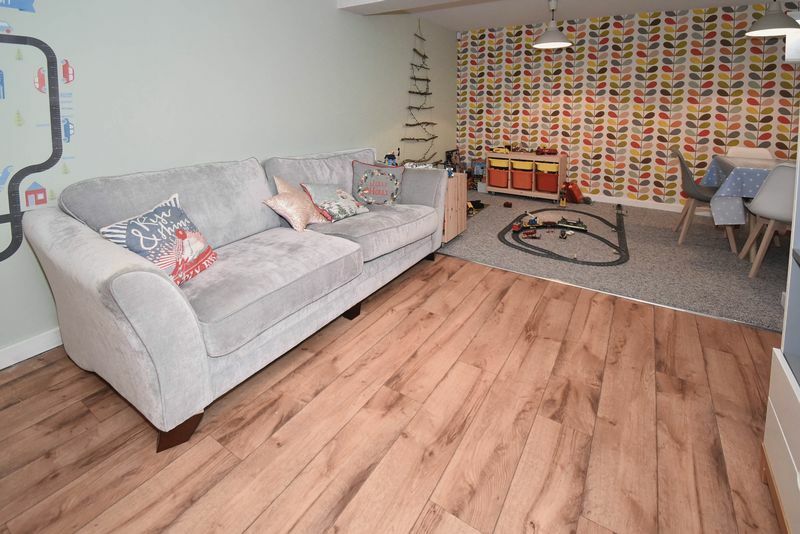 Contemporary grey plank style floor. PVC double glazed window to the front. Central heating radiator. 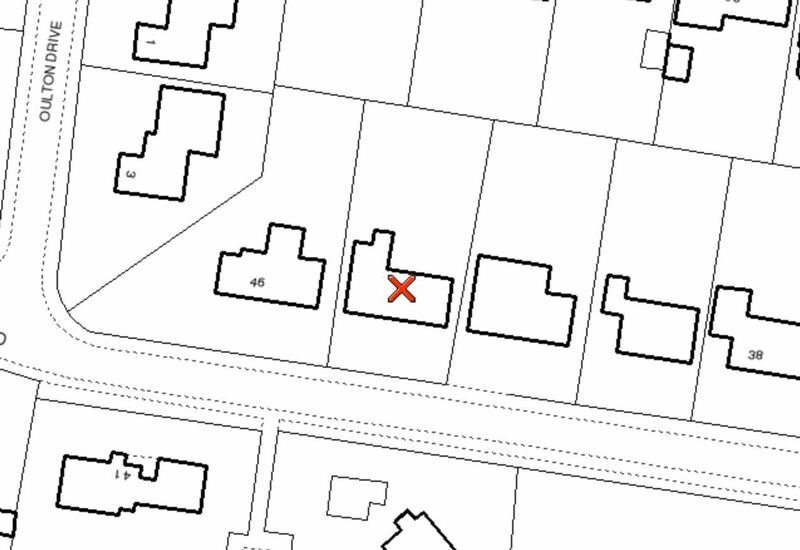 The garage store is adjacent and so the room could be enlarged with some building work if so desired. PVC double glazed window to the front. 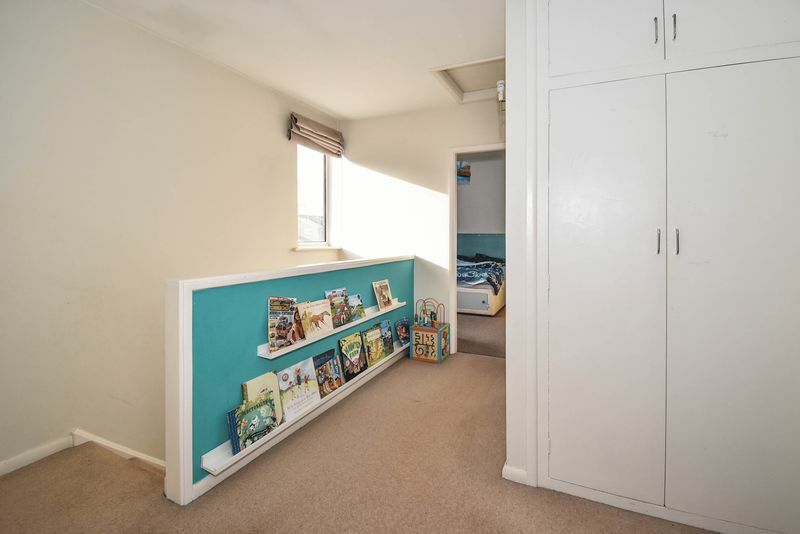 Large built in storage cupboard. Access to the bedrooms and bathroom. PVC double glazed window to the front. Central heating radiator. PVC double glazed window to the side. 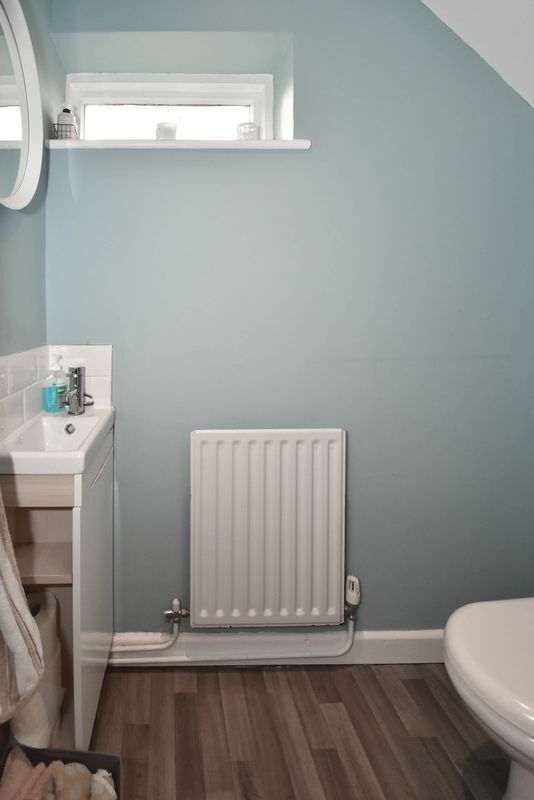 Central heating radiator. A luxurious four piece designer bathroom suite you will adore! 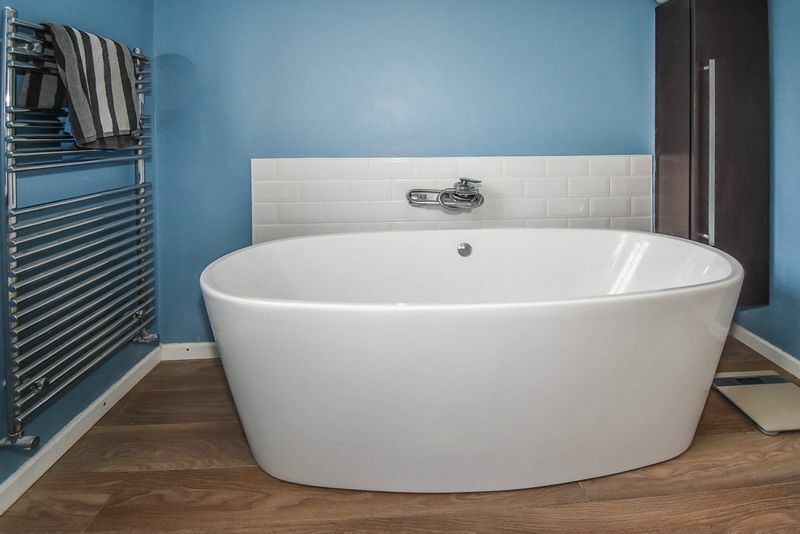 The suite features matching contemporary wood storage cabinets and white designer sanitary ware pieces seat against a contemporary wood effect floor and stylish bevel edge brick tile wet areas. 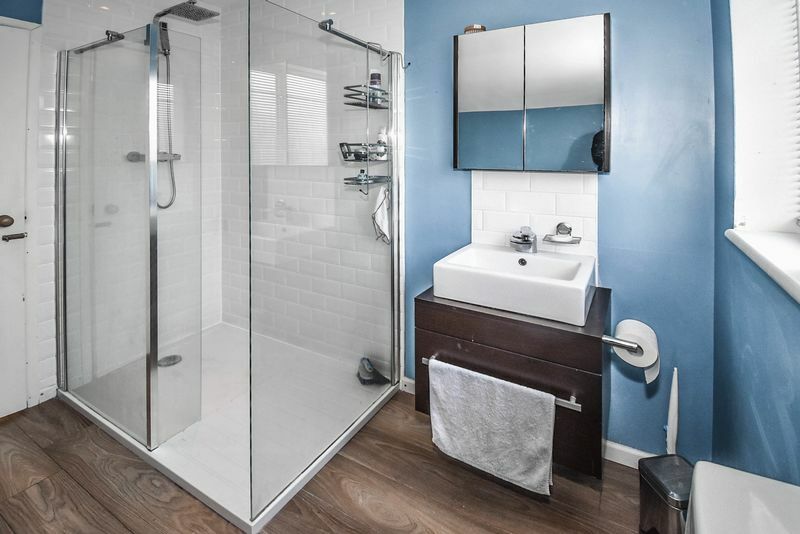 The suite comprises: freestanding bath with chrome mixer shower tap; wall hung storage cabinet with integrated wash basin with chrome mixer tap and matching style mirror cabinet above; large 'frameless' modern shower cubicle, with over head soaker and hand held shower on a riser rail; button flush WC; chrome ladder heated towel radiator; fanlight. Useful store, not the size of a full garage but with pace for bikes and gardening equipment etc. Light. 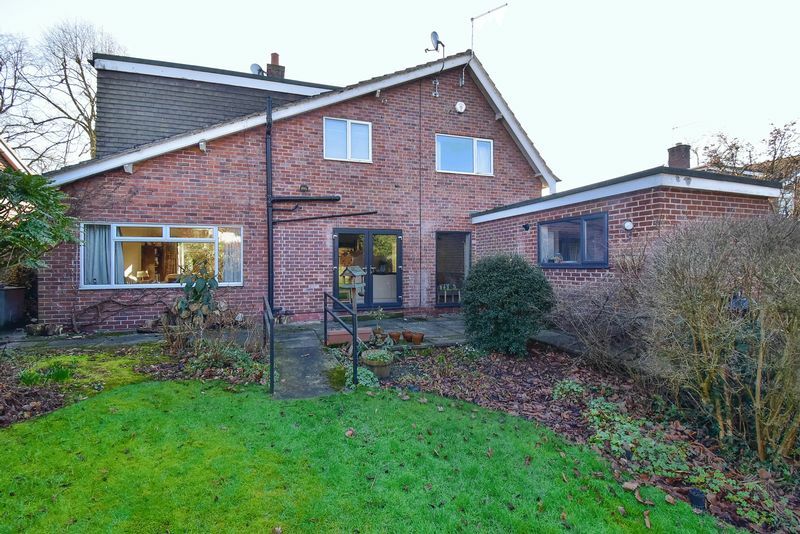 The property occupies a decent plot with front and rear gardens and access pathways to both sides of the home. The lovely gardens enjoy much maturity and generosity. The front garden incorporates a driveway and a lawned section with mature stocked borders. 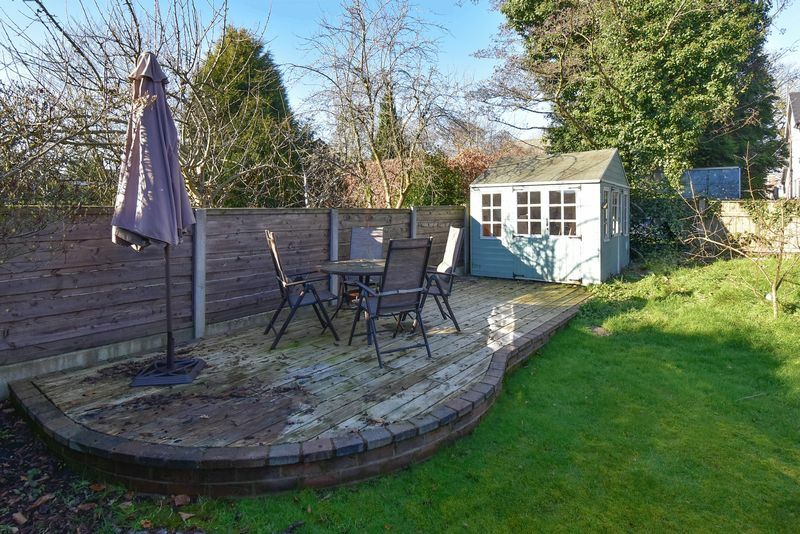 The rear garden is a fantastic size and comprises a wrap around patio adjacent to the home, a large shaped lawn with mature stocked beds and borders plus a wood deck dining terrace with space for a garden house. The garden enjoys much natural screenage promoting degrees of privacy.